Learning Disabilities and Related Disabilities 13 Edition The book that set the standard for those working toward certification in special education has been revised and updated to meet the needs of a new generation of teachers and students. A cross-categorical emphasis that makes it suitable for a broad number of courses-including those aimed at teaching students with related disabilities and those teaching students on the Autism Spectrum. 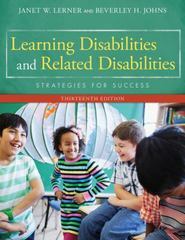 The authors describe the characteristics of learning disabilities as well as other disabilities, and offer practical teaching strategies for general education and special education teachers, school psychologists, administrators, and related professionals. Pre-service and in-service classroom teachers, who are increasingly responsible for teaching students with special needs within general education or inclusive classrooms, will find LEARNING DISABILITIES AND RELATED DISABILITIES: STRATEGIES FOR SUCCESS, 13th Edition, especially helpful.